Please vote for me, Sugar Kyle, in the top spot on your ballot. Please do it for every account you own. I've worked hard to present a true and complete picture of who I am and what I believe in, and I think I've succeeded. So if my campaign platform and what I've said resonates with you, now is the time to help me win a seat on the Council of Stellar Management. This campaign is the first time I've ever done anything like this, so it's been a learn-as-I-go affair. It's a wonderful, stressful, tiring task. But It's also completely and incredibly worthwhile. I love Eve, and I want to see our game continue to prosper and grow. And I would very much appreciate your support. Internet spaceships are serious business. I bring a skillset to the table that ranges from my focus on all aspects of low sec to my investment in markets and ability and willingness to help new players. I want to function as a community voice for the issues I have seen gripping the game. I love low sec space like nothing else and no one loves low sec like its own residents. Be they a Faction Warrior, the most -10 of Pirates or those that find peace in a dangerous environment, they love low sec. A nod of acknowledgment is not the same as caring about the soul of the place. I don't want to read about CSM Summit without someone pushing for the recognition and awareness of low sec beside every other group. It is my foundation and it is my heart. Low sec is not an after thought. I refuse for it to be treated that way. Early on in the process, I was told not to sell myself short. Not to present myself as just a low sec player. Because I am not. I am gleeful over my market. I list it as one of my proudest accomplishments. I am not ashamed that I like to mine. I believe that the PVE video game part of Eve needs to be healthier for everyone. From the responses that I have read over the last few weeks I think that I have expressed the diversity of my thoughts about Eve. Low sec may be my foundation but I do not have tunnel vision. I see Eve as a game woven through itself. To ignore any single part of space is to damage and unbalance the delicate dance that keeps the game flowing. We bring representatives from all over the game forward because one person cannot be everything. It is a game about healthy, balanced wholes that when brought together will balance on their own tip. That is my vision at least. It is why I ask you to cast that vote for me. And now, on to the mechanics of the election. When the polls go live I will add a badge right here that will take you to a spot where you can vote for me. Please use it so you don't have to spend the time searching for a path to the polls. Remember that each Eve account you have subscribed is eligible to cast a vote. Who would you like as our second and beyond votes? Which other candidates would you work best with? I'm still working on that post. It has Steve, James, Ali, Psianh and Mike at my top spots. I've been struggling with ranking the rest. I'll try to get this finished tonight. I got excited and hit submit from work for this post! Done. Three accounts. Sugar at #1 on two of them and at #2 on the third. Good luck and best wishes. 7 #1 position votes for the mistress of Bosena! +1 expected after I explained what CSM is to my girlfriend. At the very least, he has complimented how you created a market for yourself (and came up with similar methods like him: heavy undercutting instead of 0.01 ISKing). Despite his "distractions" of late, I think he is an trader/industrialist at heart. 3 #1s here, too. Steve and Mike are in my top 3, and Ali and James are top 5. I've submitted my votes as well; you're a hit in Sujarento! Milkshakes. I cannot say anymore. 3 #1 votes here as well. 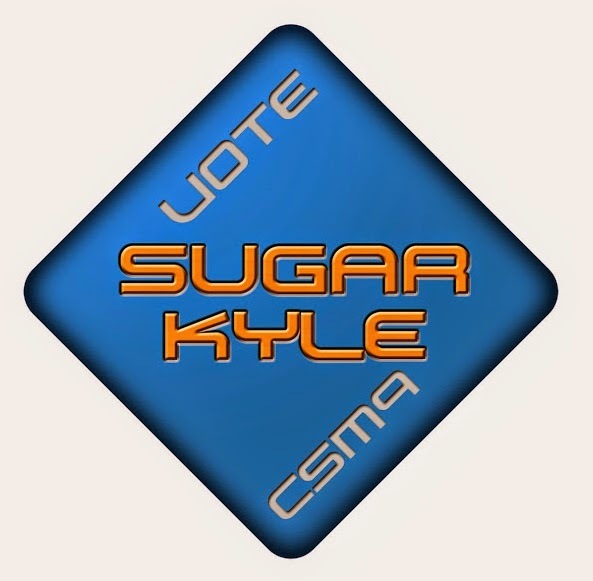 Sugar Kyle will landslide to the CSM I predict. That is the plan! Thank you for your support. I resubbed slightly earlier than planned because I couldn't wait to vote for you in the #1 spot of my roster! Good luck...look forward to tangling with you in space soon! 5 #2 votes. Had to rotate the 1 spot with the other five candidates I strongly support (Ali, James, and Steve among them) but I figured for the one person I couldn't get into a #1, five #2s would be a pretty good deal. Good luck. And I appreciate it. There is a low of strength into positions on the ballot in the election as well. Thank you. Also, offer to bake cupcakes. Carrot and stick. 4 Votes for Sugar. I just hope you get such a huge number of votes there is some trickledown to elect Mike as well. Mike has a lot of global support going on. I think we will see many familiar faces this time around. I thank you for your votes as well. Sorry to say I can only give you the one vote. I'm perhaps the only capsuleer in New Eden with one account! But you have my top spot! This blog, and low-sec lifestyle brought me back to space. Voting for you is the least I can do in gratitude. I appreciate it. One vote is nothing to scoff at. You, as a player, have selected me. I am honored. +1 #1 from the UK too. Enjoy reading the blog and look forward to seeing you putting as much effort into the CSM. Fly dangerous! Thank you. And I will! I (like many others) trust Gevlon and therefore I'm following his advice for 3 #1 spots!